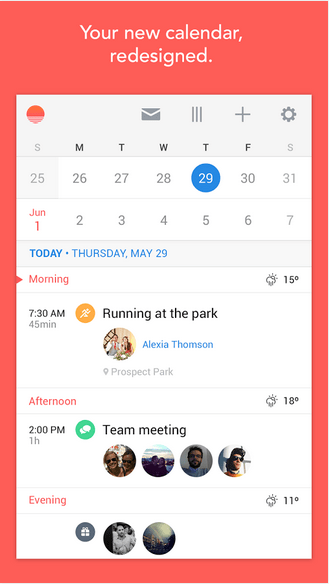 Sunrise Calendar, a smart calendar app for Android that aggregates users’ personal and work calendar. Your Facebook friends’ birthday reminders, Linkedin appointments, Evernote reminders and much more, comes all under one app. So, now you can start your day with this cool Sunrise Calendar. When the app first arrived, the default method for signing up was through Facebook which had been a good enough reason. Now, you will also have the option to sign in through your Google account. You can also add your work and personal accounts, Google accounts and Linkedin accounts to the calendar. What makes sunrise most enjoyable is its great design to give you a layout of what your day is going to look like. So, from the beginning of the day you can see how you are going to dress according to the weather outside. And further more, you can even see what appointments and meetings you have lined up for the day or which events you are supposed to attend etc. The beneficial feature about the app is that it automatically adds up icons like Skype to the calendar if you have a Skype appointment or it will put up a meal icon if you have a dinner lined up for the night. The calendar will be updated by Google maps to make it more convenient for you to reach your destination. You’ll no longer look for the address or get late for your meetings. You can also shift between the views from month view to 2 week view and vice versa, just to have a broader eye on your schedule. To shift back to the day simply tap on the icon in the bottom left hand corner. If you tap on the sunrise icon, you will be able to see all your invitations and also you can add a new event just by tapping on the + sign. If you sign in through Facebook, you will be able to add all of your friends’ birthdays to the calendar, so that you know when and whom you should be wishing. The cool feature is that you can wish your friends directly through the app. You will be given an option to either post on their timelines or send them a birthday text message right within the app. The app also supports updates from Evernote which is a very useful feature. All your reminders from Evernote will be shown in Sunrise calendar and can be edited with this app as well. Moreover, it gives you a Tripit information for your next flight as well as Foursquare. It also gives two-way synchronization for Github and Asana. You can also get updated for the concerts happening in the future by it’s Songkick services. Sunrise is a very nice organizing app especially if you have busy schedules and you fear to miss your appointments or other life events. It notifies you in time and never gets late. The app can be synchronized with many popular apps like Facebook, Evernote, Tripit, Asana and Github. Download from Sunrise Calendar Google Play store and also you can download Sunrise Calendar apk.